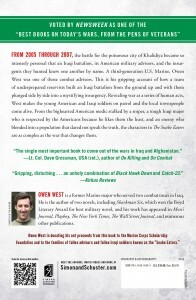 In this riveting narrative, U.S. Marine Major and acclaimed novelist Owen West puts readers into the boots of an isolated band of American advisors and Iraqis fighting together in tumultuous Anbar Province, where the people they are trying to protect and the insurgents who are trying to kill them are indistinguishable. All roads out of Iraq and Afghanistan lead through the deployment of U.S. advisors, yet Americans have scant understanding of what these men do. President Obama, for example, has several times distinguished between combat troops and advisors, when the exact opposite is true: advisors succeed by setting the example in combat. The Snake Eaters follows one team of underprepared reservists and National Guardsmen who arrived in Iraq unprepared for the reality of the mission, built an Iraqi battalion from the ground up, and plunged into battle side-by-side. In 1972, Bing West wrote the classic account of military advising in Vietnam: The Village. Forty years later, his son Owen, a third-generation Marine, was deployed as an advisor to Iraqi Battalion 3/3-1, the “Snake Eaters,” who became the first Iraqi soldiers granted independent battle space. With a novelist’s flair and a warrior’s eye for combat detail, West takes readers inside the poisonous city of Khalidya, where violence came often and suddenly in the ongoing quest for intelligence about an enemy that was closely mixed in with the population and no one dared speak the truth. The young American and Iraqi soldiers on patrol and the local townspeople come alive in The Snake Eaters, revealing war as a series of human acts. From Major Mohammad, the Snake Eater who draws the greatest respect from the Americans precisely because he likes them the least, to the big-hearted Sergeant Blakley, a medic stalked by a sniper sworn to kill him, the people West writes about are as complex as the war that changes them. Battalion 3/3-1 succeeded in pacifying their territory, making West’s exceptional book as instructive as it is impossible to set down.